Natural food can help you to fight skin damage caused by the sun and pollution, reduce wrinkles and improve overall skin texture. Scientists observed that to keep our skin radiant, glowing and ever young we need Vitamin C, Hyaluronic Acid, and Naringenin in our daily food. There is a growing body of research showing that these three components in diet affect our skin complexion. If you want to keep your skin young and soft, you must take protection of the collagen and elastin in your skin. There are certain foods which can enhance your skin’s natural sun protection. They boost skin’s ability to ward off the damages of UV exposure. I am giving below the list of natural foods that contain Vitamin C, Hyaluronic Acid, and Naringenin. These ten top foods will help you to keep your skin soft, glowing and radiant. Instead of using single type of food, researchers are clear that using a range of beneficial natural foods is always best for keeping skin at its healthiest. Each of them have special quality and they are the best foods for beautiful skin. 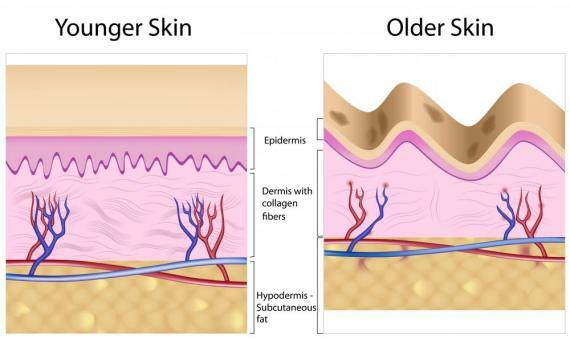 The skin is made up of two principal layers: the top layer (epidermis) and the the deeper layer( dermis). The dermis (the lower layer) contains collagen, elastin and moisture retaining molecules hyaluronic acid. Collagen provides skin firmness and elastin provides the skin elasticity and rebound. However, as we grow old, body reduces the the production of collagen, elastin. They are also damaged by overexposure to UV of sunlight. The biggest cause of aging skin is the decrease in the production of collagen and elastin that is needed to help skin maintain its integrity and tone. Without healthy elastin, collagen begins to become weak and even more rigid. Lack of elastin and collagen give the skin the appearance of roughness, uneven tone, brown patches, thin skin and deep wrinkles. If you want to keep your skin young and soft, you must take protection of the collagen and elastin in your skin. Vitamin C is the key for maintaining healthy, youthful skin. Vitamin C provides potent antioxidant protection, shielding skin from damaging free radicals. Free radicals are the molecules that damage the collagen of the skin and promote premature aging. Free radicals causes skin’s dryness, hyper pigmentation, and dark spots. Vitamin C is a powerful antioxidant that slows the rate of free-radical damage. It helps combat and even reverse hyper pigmentation of your skin. Vitamin C also help to boost healthy collagen production. Low vitamin C intake prevents collagen production, which weakens your skin and causes tears. Blueberries, strawberries, orange and lime are best source of natural vitamin C. Vitamin C along with vitamin A play pivotal roles in repairing the tissues underneath your skin and prevents damage caused by free radicals. Hyaluronic acid (HA), also known as hyaluronan, is found in virtually all of your body’s cells. HA attracts and retains water. As you age, your body’s natural stores of HA are depleted, and this plays a part in some of the most visible signs of aging. The average human body contains roughly 15 grams of HA, one third of which is degraded and synthesized on a daily basis. When the outer layers of skin lose their ability to maintain normal moisture levels, the skin become dry. Scientific studies have shown that HA improves skin hydration, stimulates production of collagen in skin. As we age, skin moisture can drop significantly, which makes the skin lose elasticity and expose the signs of aging on the skin. Hyaluronic acid has its unique ability to hold in moisture. Starchy roots and tubers like potatoes and sweet potatoes are some of the very best vegetable sources of hyaluronic acid. Magnesium is needed in the body to synthesize hyaluronic acid, so consuming foods rich in magnesium, like avocados, broccoli, peanuts, potatoes, soy and spinach can keep hyaluronic acid levels from dropping too low. Naringenin is a natural compound (a flavonoid) found in fruits such as grapefruit, oranges, and tomatoes. Flavonoids are the most important plant pigments for flower coloration, producing yellow or red/blue pigmentation in petals designed to attract pollinator. They give a protective layer on fruits, flowers and leaves. These molecules have a structural inherent antioxidant activity and anti-inflammatory properties. Naringenin is an excellent antioxidant that slows the rate of free-radical damage of the skin. It works excellently against UV damaged skins. 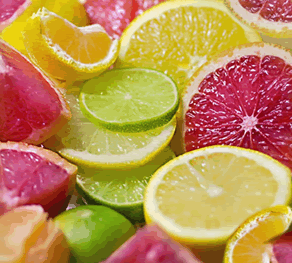 Naringenin is one of the most abundant flavanones found in fruits such as grapefruit, lemon, tangerine and orange. They have the natural power to protect the skin damage and prevent wrinkles. Many berries are high in flavonoids, particularly red, blue and purple berries. Darker and riper berries tend to have higher flavonoid values. 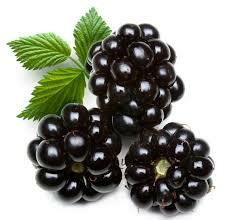 Blackberries are a very good source of dietary fiber, vitamin C, vitamin K, and manganese. Blackberries are special, beyond their basic berry goodness. They also rank well for antioxidant strength, with notable levels of polyphenolic compounds, such as ellagic acid, tannins, ellagitannins, quercetin, gallic acid, anthocyanins and cyanidins. By many accounts, blackberries are considered one of the strongest antioxidant foods. 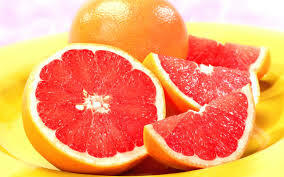 Grapefruits vary in color from white or yellow to pink and red and can range in taste from very acidic and even bitter to sweet and sugary. Grapefruits are available throughout the year. Grapefruits are excellent source of vitamin A and vitamin C. It is also a good source of pantothenic acid, copper, dietary fiber, potassium, biotin, and vitamin B1. Grapefruit also contains phyto-chemicals including liminoids and lycopene. Kale is one of the healthiest vegetable. Kale is a dark, leafy, cruciferous vegetable that is high in beautifying vitamins and nutrients. Kale is fairly low in calories, high in fibre, no fat and more in calcium than milk. It is abundant in vitamins A, C and K. Kale is full with antioxidants, which protect against free-radical damage that can happen during sun exposure or exposure toxins from smoke and other pollution. 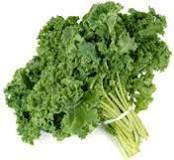 Kale is also packed with Omega-3 fatty acids. Kale contains a good amount of vitamin K, too, which is great for increasing skin elasticity and reducing the appearance of dark circles under the eyes; but vitamin K can be dangerous if you’re on blood-thinning (anticoagulant) drug. Green tea is now the world’s most widely consumed beverage after water. Studies have shown green tea polyphenols have protective effects against free radicals, infections, and toxins. Both animal and human studies have credibly demonstrated that topical green tea formulations reduce sun damage. Green tea appears to exert sun damage protection by quenching free radicals and reducing inflammation rather than by blocking UV rays. Green tea contains B vitamins, folate (naturally occurring folic acid), manganese, potassium, magnesium, caffeine and other antioxidants (notably catechins). 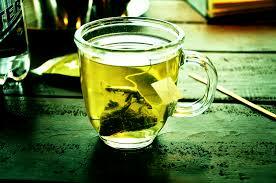 Two to three cups of green tea per day is good for overall health and skin. It may also be useful to incorporate green tea into your skin maintenance routine to possibly slow down skin aging. 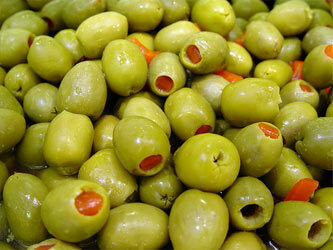 Olives are one of the world’s most widely enjoyed foods. Olive oil is a very popular product and people use it for skin for centuries. Olive oil contains three major antioxidants: vitamin E, polyphenols, and phytosterols. It can quickly and easily it softens dry skin. The easy way to use it is to simply to rub it on your body after your shower. You can also use olive oil as an exfoliating applications. A common exfoliating method using olive oil is to mix 1 tablespoon of the oil with natural sea salt, rubbing this mixture over the skin. Rich in vitamin E and A, olive oil helps prolong youth, hydrates the skin, maintains its elasticity and softness. Olives are also a source of dietary fibre as an alternative to fruits and vegetables. Olives are nutritious and rich in mineral content as sodium, potassium, magnesium, iron, phosphorus and iodine. Olives provide essential vitamins and amino acids. Flaxseed is a major source of the healthy fat omega-3. Skin cells are surrounded by a fatty layer made from this and other fats so, the higher your omega-3 intake the stronger that layer is, and the plumper your skin cells are – which helps disguise lines and wrinkles.” You’ll find flaxseed oil in health stores. 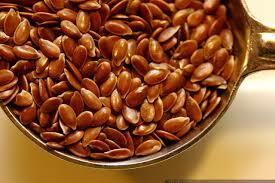 Flaxseed are a very good source of dietary fiber, vitamin B1, and and copper. They are also a good source of the minerals magnesium, phosphorus, and selenium. Beetroot is a rich source of vitamins and minerals can give you healthy and glowing skin. Beets improve complexion, reduce inflammation, help with dry skin, reduces freckles and age spots and makes your skin younger looking. This amazing root rejuvenates the skin and helps get rid of acne. 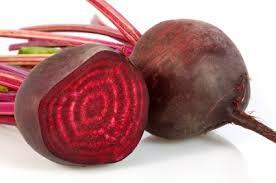 High in folate, beets stimulate the production and repair of cells, which helps protect against premature aging. Beets are a unique source of betaine, a nutritious that assist protects cells, proteins, and enzymes from environmental pollution. Beetroots are rich in vitamin C, manganese, folate, vitamin B6, betaine and potassium. It contain pigments called anthocyanins that help support collagen production in the skin. Beet juice detoxifies the digestive system, and fight wrinkles and skin conditions naturally with folate! It prevents age-related macular degeneration with vitamin A and carotenoids, and preserves brain function with nitrates that improve blood flow! You can take sweet potatoes and carrot with beet roots. Carrot not only help prevent sun damage, but might even reverse it. They provide natural UV protection for the skin. 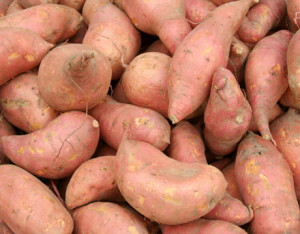 Sweet potatoes have the additional advantage of having high levels of magnesium. The mineral magnesium is essential for the synthesis of hyaluronic acid in the body. Avocados are super rich in healthy monounsaturated fats, vitamins A and C, and fiber. They help brighten dull skin, smooth tone, and moisturize on a deep cellular level to prevent dryness which can lead to wrinkling. They help protect from sun damage and environmental pollutants and their fiber and lubricating oils help digestion which keeps your intestinal tract healthy and able to efficiently remove waste so your skin glows. The avocado’s natural skin offers some disease and insect resistance, which allows them to be grown in environmentally sustainable ways. 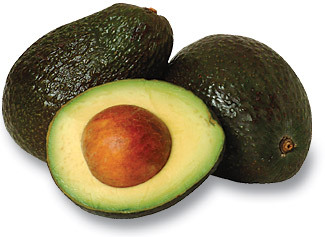 Beta-carotene and lycopene are two of the organic compounds found in large quantities within avocados. Both of these have been connected to improving your overall health and tone of your skin and eliminating signs of premature aging. Salmon fish is one of the richest concentrations of omega-3 fatty acids. These healthy fats nourish the skin by reducing the body’s production of inflammatory substances, decreasing clogged pores, and eliminate fine lines and wrinkles. In a recent British study, fish oils provides guard against sunburn and DNA changes that can lead to cancer. In addition to omega-3’s, salmon contains another interesting nutrient: astaxanthin. Astaxanthin, a carotenoid that gives salmon its pink color, is a powerful antioxidant that has been shown to remove the free radicals created by skin exposed to ultraviolet rays. You can easily go for all out a sun protecting meal, eat poached wild salmon with a tomato and bell pepper salad drizzled in olive oil. 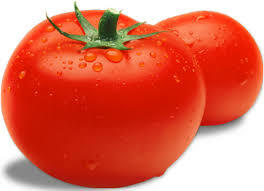 Not only do the tomatoes taste great but they also help to keep your skin healthy. It is necessary to consume tomatoes as they have lycopene, which is an antioxidant and hence works as a sunscreen from within. The presence of antioxidants make tomato an anti-aging product as they help in fighting cellular damage and reddening of skin. It is recommended to have at least 16 milligrams of lycopene per day as it reduces the number of free radicals in the body and also helps to retain the moisture in people who are exposed to air-conditioned environments. Skins with high lycopene content is not affected by the harmful rays of the sun. Naringenin is one of the most abundant polyphenols in tomato. People who ate 5 tablespoons of tomato paste daily, along with almost a tablespoon of olive oil for 12 weeks, had 33% more protection from sunburn compared to a control group that ate just olive oil, according to a 2008 UK study. Tomatoes and tomato products enable your skin to take in oxygen, delaying aging and wrinkling. Natural food with vitamin C, Hyaluronic Acid, and Naringenin can help to fight skin damage caused by the sun and pollution, reduce wrinkles and improve overall skin texture. Scientists are in search of oral supplement but it has a long way to go. Presently, they are not free from the side-effects. Till then, natural foods with healthy lifestyle are the best way for radiant skin. 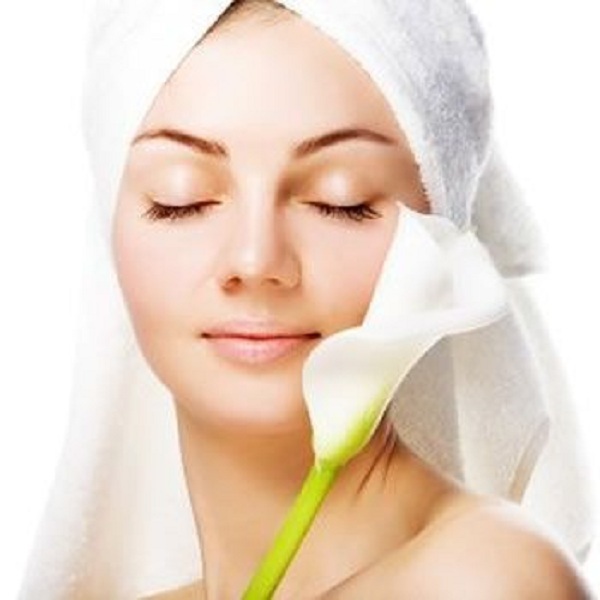 We have discussed here top ten natural foods for radiant and glowing skin. These top ten natural foods for beautiful skin are kale, grapefruits, blackberries, tomato, avocados, beet roots, green tea, sweet potatoes, olives and flax seeds. 1. Skin Wrinkling: Can Food Make a Difference?, Journal of the American College of Nutrition. 2. Potential of herbs in skin protection from ultraviolet radiation. Pharmacogn Rev. 2011 Jul-Dec; 5(10): 164–173. 3. Nutritional protection against skin damage from sunlight. Annual Review of Nutrition,2004, Vol. 24: 173-200. This entry was posted in Anti Aging, Articles, Health, Skin Care, Well-Being and tagged anti-aging, anti-aging secrets, anti-inflammatory, antioxidant foods, Beautiful Skin, Blackberries, collagen, Collagen Elastin, elastin, flavonoid, Flavonoids, Flaxseed, Glowing Skin, Grapefruits, Green Tea, Hyaluronic, hyaluronic acid, Kale, Naringenin, Olive oil, Olives, Omega-3, Prevent Wrinkles, Radiant Skin, Sirtuins food, sun damage, sunburn, Sweet potatoes, UV protection, Vitamin C. Bookmark the permalink.